I-74 to Hwy 3 exit, then south to the center of the town. At the Decatur County Courthouse corner nearest E. Main and N. Franklin Sts. I teach in Greensburg and we all love our tree. The most unusual thing about the tree is that is an aspen! Aspens are not found in Indiana, which is how the bird dropping with a seed story came about. Greensburg is known as Tree City! Unfortunately, the courthouse was under construction. The tree was visible behind all the scaffolding, but didn't make for a good pic. The historic downtown Greensburg district was quaint. 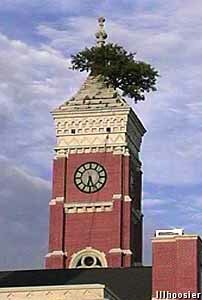 The courthouse tower grows new trees constantly, and steeplejacks have to cut them out and trim the main tree. When the current tree gets too old or a disease, they will allow one of the others to grow and take the current one down. Never has one been planted. They are believed to be seeds from bird droppings. As a former resident of Greensburg, it's a well-known fact (but not really talked about) that there's been over 16 trees to grace the tower. The tree is the only "claim to fame" the town seems to hold onto, so they keep the latest tree alive by any means...at least, until it dies, and they have to replace it, too. Also...the joke. Eh, I think it only amuses the older generation now. Most of the younger crowd doesn't give a damn about the tree or the festival...or the town. It's a shame, really (and that makes this 28-year-old sound so old saying this), but it's all a part of "progress." Tree on the Decatur County Courthouse roof, Greensburg, Indiana. Q: Do you know how the tree gets water? A: From the spring in the clock. Grave of Wendell Willkie, Rushville, IN - 19 mi. Paulhenge, Versailles, IN - 21 mi. Possible Largest Collection of Cookie Jars, Metamora, IN - 20 mi. James Ruppert Mass Murder House, Hamilton, OH - 50 mi.